Regardless of the divisiveness in our country, we are to shine with the kindness, joy, hope, love and caring nature of our Lord, Savior and Master, Christ Jesus. At the risk of repeating myself… GOD LOVES YOU! It doesn’t end there… He wants us to love one another as well. That’s where, sadly, it gets tricky – and I’m not even sure why. If we profess to have the Holy Spirit of God living inside us, it should be a piece of cake to love our brother, right? We must live together as brothers or perish together as fools. – Martin Luther King, Jr.
We can show love to others – but it takes a lot of prayer beforehand. Let’s get on our knees and pray today for the necessary tools so that we can show mutual respect for one another! Once we’ve asked God to help us, let’s rise and be bigger! I want to rise about petty behavior, don’t you? Love, forgiveness, showing interest in others in a genuine manner – that’s the blessing I want from God today! I will ask Him to give me the gift of real compassion for all people. I want to exercise honest sympathy and true empathy in life. Think of the sacrifice Christ made for all of us – then think of the way He wants us to live. Let’s be the best representatives for Christ we can possibly be in 2016. There is such darkness in our country – and in our world. Let’s humbly ask God through Jesus for LIGHT and LOVE which pokes holes in the darkness. It’s common knowledge that we hold out an olive branch these days by doing or saying something in order to show that we want to end a season of disagreement with someone. When Noah’s ark had floated around on the flood waters for such a long time, he sent a dove out to see if the waters had subsided enough for them to leave the ark. As we know, the dove came back with an olive branch, so Noah knew it was safe to open the doors of the ark and let everyone out. We’ve been holding out olive branches to each other since then. As we apologize, make concessions and sometimes even bend over backwards, we hold the olive branch out to others. The olive branch is as delicate as the forgiveness it represents. As you can imagine, the olive branch is lightweight (after all, it was carried by a dove). How ironic that this humble branch should represent peace and forgiveness. The next time you feel the need to hold out an olive branch, think of the word fragile. The olive branch is as delicate as the forgiveness it represents. There is not a promise in God’s Word that encourages my heart more than this one. There is no longer any condemnation! 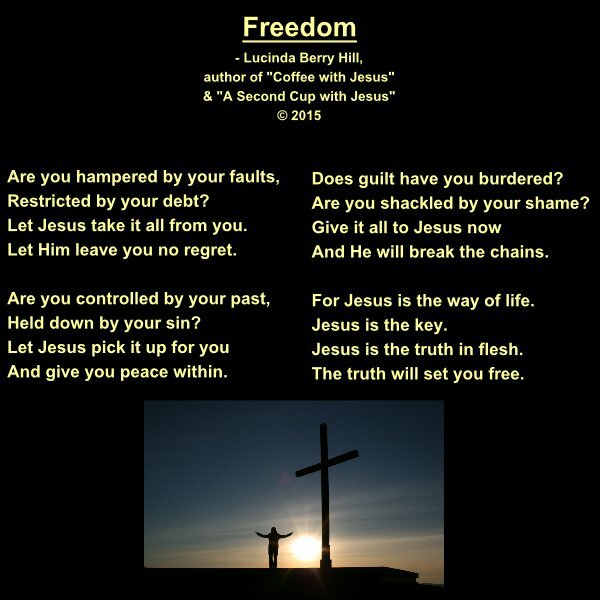 Forgiveness of sins and the ability to finally let go of shame and regret means one thing – I am free!!! But why is this verse here? It begins with the word therefore, so we need to back up and see what this verse is there for… let’s look at the last part of Romans 7. If we’re honest, we admit facing the same struggle – some days more than others. Remember the cartoons with the angel on one shoulder and the devil on the other? Here’s the deal… if you continue living in sin, you are a slave to it. No matter what type of sin it is – you’re bound to it. The only real freedom you will ever experience in your life is through Jesus Christ. He loves you and wants to set you free from the chains of sin. Sin demands so much of you – it is not possible to get straightened out on your own. It takes supernatural help. I pray that you will find a quiet place and bow your head to talk with God, in Jesus’ name. Let Him have everything that binds you today. He can give you a whole new attitude and outlook about your life from this moment forward. Join me in prayer for our country. My spirit is heavy and I’m so weary of the widening chasm which is leading to hate and division in America! I just want to scream – STOP IT!!! Enough already. Am I the only one? These tragedies are happening much too often. What fuels the fire of hate that leads to this end? What is the answer for the United States? What will it take to keep the United States… well – united? I believe with my whole heart that Carman sang about the only hope to solve America’s problems nearly 20 years ago. When will we listen? When will America humble itself as a nation before God? The fact that this shooting happened makes me so sad, but that it happened in a church – a place that should have been safe… well, I can hardly wrap my mind around it! Do I have the answers? No, but it’s my hope that America will seek God with a humble heart and ask Him to please heal our sick, immoral, divided, irreverent land. The Bible is not just a book – it’s the Word of God. B.I.B.L.E. = BASIC INSTRUCTIONS BEFORE LEAVING EARTH. Today is WORLD KINDNESS DAY! How many ways are there to be kind? We express kindness to others in response to the kindness Christ extended to us. When God’s Holy Spirit speaks to our hearts and impresses on us to extend kindness to someone, it’s imperative we take action. Somebody in your realm of influence needs a blessing from God, and maybe God is using you to deliver it. It’s so terribly sad that the whole world cannot (or rather will not) adopt the policy of politeness to others. Such hate is so wicked and evil. It’s beyond my realm of understanding why people who want to kill for any reason. We just have to be the people God wants us to be no matter what – to everyone. It’s not a suggestion, it’s a command. We must be kind – to everyone. Last week I ate at my local restaurant and saw a Muslim mother with her two small children. I looked into the eyes of those children – their big, round, brown eyes looked so sweet and innocent. I told their mother how beautiful I thought her children were and she seemed very pleased and a little proud by my comment. Today’s special day strikes a very dark, minor, sad chord in my soul. Today is INTERNATIONAL DAY OF PEACE. My first instinct was to turn away from it. I could write something fluffy and light – and maybe that is what you would rather read, I don’t know. But something made me come back to it, I suppose because I have prayed that God would intervene and grant us peace on this ol’ earth. In the meantime, we just have to ask that God keep the flame of God’s Holy Spirit burning in our souls no matter what. I know you’ve prayed for the same thing. You’ve let me know you are praying. We’ve agreed together in prayer for peace on planet earth. We always ask and end our prayers with “Thy will be done” though. So be it. We keep being the people God wants us to be and we keep praying for His will. It would have been easier to write about the many times my husband and I have played mini-golf. How he keeps score – and always wins (I find that very suspicious in nature – hmm) but the International Day of Peace is pulling at my mind. I want peace so badly and feel so sad because there are those who just want to kill because everyone is not like them. I don’t understand people who can not live and let live. Of course I want to share my faith, but I do not condemn any who don’t choose to accept it. I’m sad, but I do not say you have to perish by my hand if you refuse it. That’s God’s call to make – not mine. On this day in 1974, President Gerald Ford pardoned Richard M. Nixon of all wrongdoing in the famous Watergate scandal. While a Presidential pardon is quite a big deal, an even more important and eternal pardon was made a very long time ago on a hill called Calvary by Christ Jesus. The pardon offered to us by God’s own Son has eternal merit. It is not only offered to the rich and affluent, but it is offered to everyone regardless of race, background or social standing. Christ paid the supreme sacrifice to forgive us of our sins. On this INTERNATIONAL PARDON DAY, won’t you accept the free gift given for you so long ago? As Christ forgave us, so we are to forgive each other. If you are holding a grudge against those who have committed some offense against you, Pardon Day grants you a valid reason to check your feelings and the time that has passed, and to let that resentment and anger go. If you refuse to forgive (even if not asked to) it will take a toll on your attitude, life and eventually your very health and well-being. Research has proven that people who make a choice to give up resentment toward others live longer and have better cardiovascular and nervous systems. To harbor a bitter feeling against someone is to allow them to take up residence in your mind rent-free. Forgiveness is an act that brings happiness to those who give it. To release the negative emotions held inside is a gift you give yourself. The one you harbor bad feelings toward has moved on – you need to do the same. Today may be a good time to incorporate some “magic words” into your vocabulary. It’s great to hear someone say, “Excuse me” or “Pardon me” if they accidentally bump into you or run their shopping cart over your foot or something. Those simple words defuse anger and let you know the act was not done on purpose. One misconception remains about extending a pardon. By no means do you have to fall back into the old trap you were in before with that person. Na na na na huh-uh! I’ve been guilty of it too. You forgive and then get back in the saddle, right? Then you end up having a similar problem. Sigh. I know. Sometimes you just have to cut the ties that strangle you. Do everything in your power to pardon because Christ gave His all to pardon you. Trust me when I say it is not worth carrying a root of bitterness for one more day. Do what you have to do to rid yourself of it. You can write a letter, send an email, facebook message or call that person on the phone. Get it out and get over it so you can move on. If the person you’re bitter towards is no longer living, you can write a letter to them with nothing held back – then take it to their grave, read it to them, light it on fire and burn it to set yourself free! I want everything clear ‘tween me and thee so that all can be clear ‘tween my Lord and me.